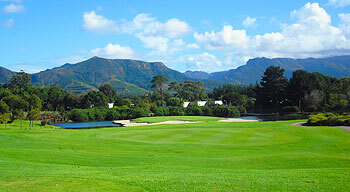 The course is part of a long-established estate that includes a 17th century wine farm, hotel and residential properties and the holes – many of which are doglegged – are routed through the Steenberg vineyards; moving from pine-treed parkland (there’s a tremendous par four at the 3rd with Silvermine Mountain as a backdrop) to wetlands (where the 7th is a real feature hole) then to a more heathland section (waste bunkers flank a few fairways, as at holes 9 and 12) before ending in parkland again (with the creek coming into play at the last two holes). The feature holes on each nine are both par threes. The elevated green at the 181-yard 7th is surrounded on three sides by a lake, with white sand in a horseshoe-shaped bunker separating the grass on the putting surface from the water. The wickedly contoured green at the 203-yard 14th is one of the biggest in the country (at nearly 85 yards long) and it’s circled by six enormous bunkers which act as a buffer between the putting surface and some thick local shrubbery – there’s little room for error at either of these two hair-raising holes! Expensive, greens in terrible condition (punctual problem apparently), NOISY greenkeepers on 3/4 of the holes. If you are from abroad, don't go there. Unfriendly golf with dull lay-out in an average residential estate. A waste of money. No fun at all.Players with poor etiquette. Hotel fine but given the kind of golf, no place for foreign golfers. Looks beautiful but that is all. South Africa has much more to offer. Golf at Steenberg is a great experience and if you can add in a stay at the hotel too, you will not be disappointed. For the visitor to Cape Town, this is an ideal first course to play as you can reach the estate easily from the airport in around thirty minutes and without being cruel, the course is not as tough as others in the south of the country. The golf club is situated in the Constantia Valley and has spectacular views all around with course conditioning very high. This is very much a members club but visitors are most welcome too. The first hole I like is the par-4 3rd, a slight downhill dog-leg to the right to a raised green with fantastic bunkering at the rear that will catch-out many playing the hole for the first time. The teeing area on the par-5 5th is a great place to be; six tee choices all next to a very picturesque water feature ahead of the hole that can play over 600 yards long. One of the feature holes comes at the 7th – a par-3 with the green surrounded by sand and water, a very visual hole especially with the Devil’s Peak Mountain in the background. My choice for the best par-5 comes at the 12th – a tree-lined hole that dog-legs to the left that has a very intimidating tee shot as there is a waste bunker running the length of the hole on the left which eats into the fairway at the dog-leg. The par-3 14th is another good looking short hole, I say short but depending on tee choice and pin position this can vary from 110 yards to 240 yards, the main reason being that this has the largest single green in South Africa – get it wrong and 3 putts are inevitable – oh yes, have you camera ready as the backdrop of the Silvermine Mountain make this one of the prettiest parts of the course. The closing hole is very good and a very strategic par-5 – a split fairway at around 300 yards needs to be considered and then at the green, sand left and water right are the big problems. Another camera tip post-round, sit on the terrace with the water in between you and the 18th green and ‘click’ – you will have a great shot that includes the back of Table Mountain in the distance. Overall, Steenberg golf is recommended but do play this early in a tour as there are bigger and tougher courses as you move further east along the Garden Route through the Western Cape.